Hare Krishna monk Alex Seibel, 19, enters the 2nd Avenue subway in New York City's East Village. These photos were part of a project titled "Young and Religious in New York" created in NYU's Master of Journalism Program. Hare Krishna monk Alex Seibel, 19, in the East Village ashram he lives in with other monks. Hare Krishna monk Alex Seibel, 19, checks directions en route to pick up his visa for a trip to India. Hare Krishna monk Alex Seibel, 19, speaks with a security guard in Union Square, where he hands out books and chants most days. A member of New York City's Hare Krishna community during an morning ceremony at the Bhakti Centre in the East Village. A train passenger checks out Hare Krishna monk Alex Seibel, 19. Catholic Minister Melissa McChesney, 24, in the living room of her Brooklyn apartment. McChesney, a Kentucky native, studied to become a police officer before finding religion. 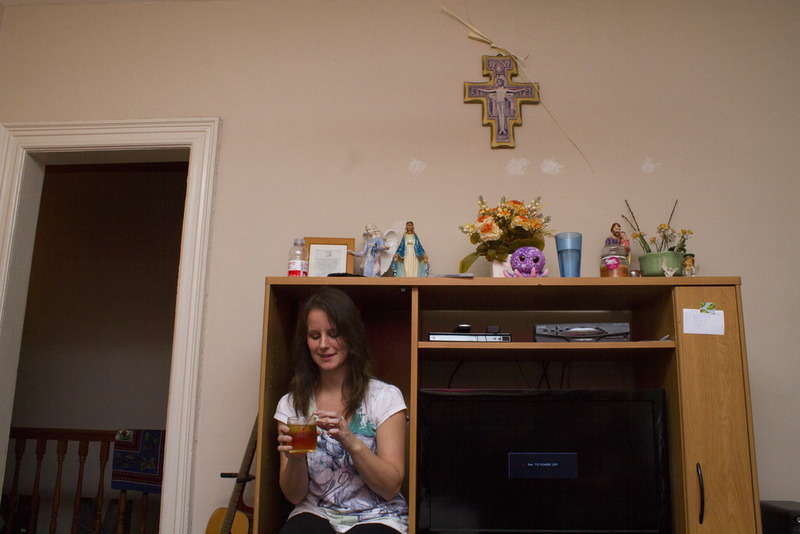 Catholic Minister Melissa McChesney, 24, in the Brooklyn apartment she shares with her sister. 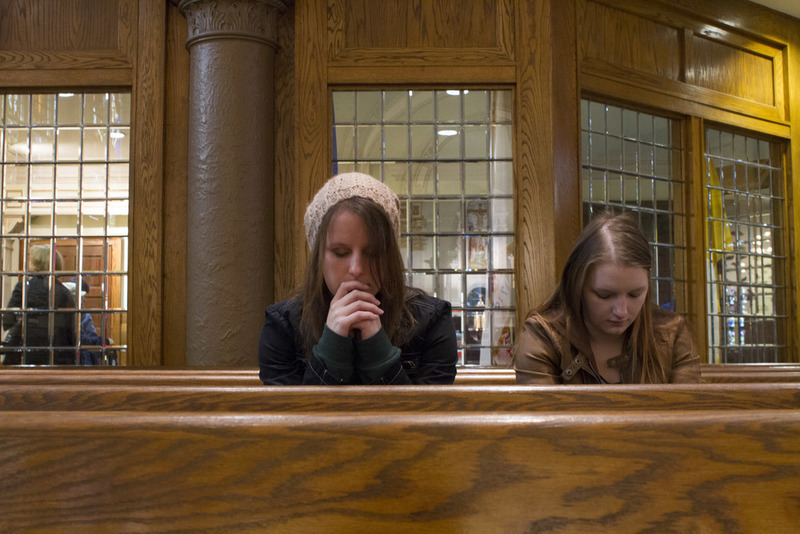 Catholic Minister Melissa McChesney, 24, prays at noon mass with her sister. Catholic Minister Melissa McChesney, 24, drinks and has multiple tattoos, but still holds traditional Catholic views against on abortion and birth control. "Pray for the preborn" reads a sticker on 24-year-old Catholic Minister Melissa McChesney's apartment door. Catholic Minister Melissa McChesney, 24, holds rosary beads before evening prayers. 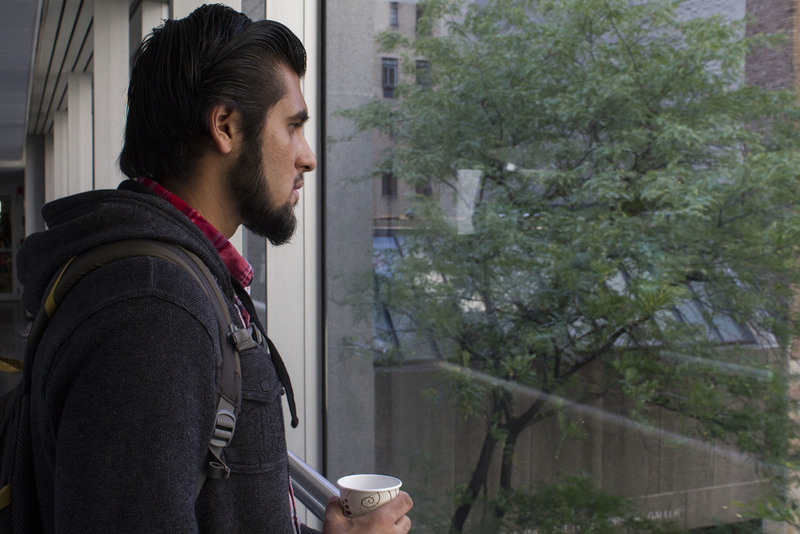 Navel Shah, 19, at Hunter College in Manhattan, before prayers in the school's designated prayer space. Navel Shah, 19, gets ready for late afternoon prayers in the Muslim prayer room at the school. Navel Shah, 19, prays inside the school's Muslim prayer room.